Crowns and bridges are a common way to replace missing teeth or to restore severely damaged teeth. 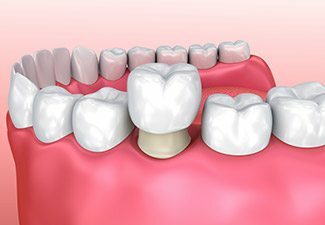 But what are dental crowns, and how are they different from bridges? And how long do crowns and bridges last? Find the answers to these and other questions below. Dr. Dennis C. Ayer is your dentist in Leawood providing top-notch crowns and bridges. Why Choose Dr. Dennis Ayer for Dental Crowns & Bridges? 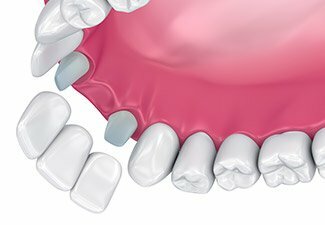 Dental crowns are thin caps that cover a damaged tooth. They can also replace one or more missing teeth with the support of a dental implant or as a dental bridge. Crowns are thin coverings that fit securely around the affected tooth. The crown can be constructed of gold, porcelain, porcelain-fused-to-metal, or metal alloys. Dental implants are completed over the course of two to three visits to your dentist’s office. In the first appointment, your treatment plan is put in place and your tooth is reshaped in preparation for the crown. Your dentist takes impressions and x-rays, and this information is sent to a separate lab for the manufacture of the crown. Once it is ready, you revisit the office for its final placement. A dental bridge is a device that replaces missing teeth. It consists of three or more dental crowns connected securely together. Traditional crowns are anchored in the gum line using the natural teeth surrounding the gap as anchors. Two crowns are attached to these teeth, and the replacements form a literal bridge over the space in between. Like dental crowns, dental bridges are completed over two to three visits to your dentist’s office. A dental bridge can also be retained by dental implants. When implant dentistry is a possibility, it is the preferred method of tooth replacement. Dental implants provide maximum stability for the tooth replacement, and improve oral and overall health. When cared for properly, dental crowns and bridges can have a long lifespan. Brush for two minutes, twice a day, and floss daily. Concentrate on the area around the base of the crown to remove plaque and prevent the buildup of bacteria. Patients who practice sports or who grind their teeth at night (the condition known as bruxism) should protect their restoration with a custom-fit mouthguard. Sports and tooth grinding place undue pressure on the teeth and expose your crown or bridge to potential trauma. A mouthguard is a simple preventive step that provides a significant amount of protection for your smile. Are you in need of restorative dental care? 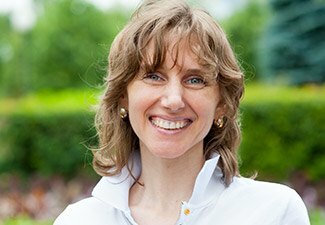 If so, do not hesitate to get in touch with Dr. Ayer, your trusted family dentist. 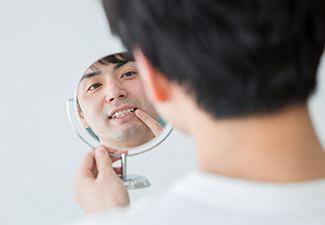 We can discuss the options for restoring your tooth back to its health with a bridge or dental crown in Leawood KS. Request your appointment today!